Ken Goodman, L.C.S.W. is available for speaking engagements, trainings, and consultation on the topic of anxiety. He speaks to both large and small groups, employing an interactive style, engaging his audience in experiential exercises and discussion. as well as live and video demonstrations of therapeutic interventions. He trains therapists on the most effective techniques to successfully treat Panic Disorder, PTSD, Phobias, OCD, Social Anxiety and Generalized Anxiety. "I found the workshops to be very helpful. It allowed me to connect with other people that share similar challenges and help me to understand that I am not alone in this journey to freedom. I would highly recommend it!" "After asking Ken to come and speak to my Direct Practice class last year at USC, I was eager to have him back. He was better than the year before and covered the topic of CBT and anxiety with just the right combination of practice theory and clinical experience. He clearly has a vast understanding of the topic and managed to bring the ideas to life. Thank you Ken for a great class. The students really enjoyed it." "Ken Goodman's presentation on anxiety disorders is excellent. He provides a clear understanding of the various anxiety disorders and gives practical and useful strategies that work to treat these disorders effectively. Through the voices of actual clients, we see how a gifted therapist working in partnership with his clients yields successful outcomes and changed lives. Ken is engaging, knowledgeable, and thorough." "As a psychiatrist, I found your talk very useful and practical. 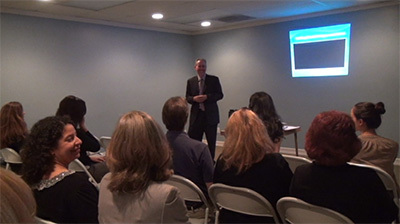 Moreover, the doctors of West Hills Hospital gained a better understanding of the current techniques in the treatment of depression and anxiety. A surgeon told me that he usually does not attend CME topics on mental health but not only did he attend, he stayed and listened to your entire presentation."